Zambia's opposition is worried that the United States might cut aid to the southern Africa country after the government refused to grant Tendai Biti political asylum. Should the Donald Trump administration decide to act against Lusaka, activists say the sanctions should be targeted President Edgar Lungu because an aid cut would only hurt ordinary Zambians. National Democratic Congress (NDC) secretary general Mwenya Musenge said Lungu's government had put at risk about $300m the US gives Zambia annually to support various projects. 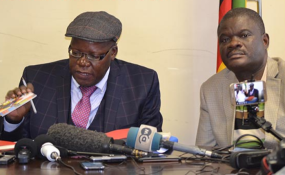 "Zambian authorities clearly abrogated international laws and protocols when they handed back Mr Biti to Zimbabwean authorities against his will," he said in a statement. "Zambian authorities should have allowed Mr Biti, a senior figure of the opposition MDC party, to exit Zambia to a country of his own choice." MDC Alliance leader Biti dramatically fled to Zambia and sought political asylum saying his life was in danger in the deadly aftermath of Zimbabwe's disputed July 30 elections. Zambia refused his asylum request and, worse, handed him back to Harare despite a Lusaka High Court ruling barring deportation. The US expressed outrage over the development, warning that it would, as a result, certain aspects of "our cooperation with the Zambian government". In Washington, the ambassadors of both Zimbabwe and Zambia to "register our gravest concerns". "We are also deeply concerned that Zambia chose to hand over former minister of finance Tendai Biti to the Zimbabwean authorities, and in the face of a reported Zambian court order blocking his expulsion from Zambia," said the Trump administration. "This decision is particularly disheartening given the courage that Zambia showed in sheltering thousands of Zimbabwean freedom fighters from Rhodesian aggression in the days of Zimbabwe's independence struggle. "We will be discussing this matter with Zambia's leaders and reviewing certain aspects of our cooperation with the Zambian government." NDC's Musenge said his party feared that if the Americans cut aid to Zambia, ordinary citizens would suffer. "As a country, we cannot afford to lose such support," he explained. "In this regard, we urge Zambian authorities to apologise to the international community for mishandling the matter involving Tendai Biti. "President Edgar Lungu should equally institute appropriate disciplinary action against technocrats for ill advising him on the matter involving Mr Biti." He added; "Looking at the statement from the U.S state department, it is clear that the Americans are not happy with the governance system in Zambia. "We urge the U.S government and other Western nations to exert more pressure on the Lungu regime so that they start respecting governance institutions." Back in Harare Biti has since appeared in court and granted $5,000 bail. He is accused of illegally announcing the results of the July 30 elections and also inciting the subsequent violence which left six people dead and several others injured.